Identification: The coyote, Canis latrans, is a medium-sized carnivore commonly mistaken for its close relatives, gray wolf, eastern wolf and red wolf. The coyote is smaller, has longer ears, and has a thinner face and nose than the gray wolf. A coyote’s size and fur color vary by region. 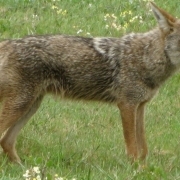 Northern subspecies are larger than southern subspecies, and coyotes living at high elevations tend to have more black and gray coloration. On average, male coyotes weigh 18-44 lbs. while females are slightly smaller, weighing 15-40 lbs. Body length ranges from 3-5 ft., and tail length 16 inches., with females being shorter. Scent glands are located around the base of the tail and are bluish-black. Fur color is predominantly gray and red, with black and white scattered around the body. The fur consists of short, soft underfur and long, coarse hair. Albinism has been found in coyotes but is extremely rare. Coyote tracks can be distinguished from domesticated dog tracks by their more extended, less circular shape. 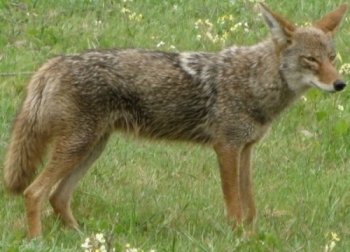 Range: The coyote is native to North America and is commonly found from Alaska through Central America. Since they can easily adapt to environments modified by humans, coyotes have been expanding their range eastward over the last 100 years. The elimination of wolves in the east by early European settlers left a niche that the coyote was able to fill. They prey upon foxes which are direct competitors for food. Consequently, areas with high coyote numbers tend to have depressed red and gray fox populations. Ecology: Coyotes are mainly active at dawn and dusk (crepuscular) when they make their unique howls that can be heard from quite a distance. They are more often heard than seen. They make dens in brush piles or near abandoned buildings and prefer to hang around fields or clearings with forest edges, tall weeds and thickets. Coyotes normally hunt alone or as mated pairs. They are very adaptable and can form loose packs when pursuing larger prey such as deer. They take down prey by the head or throat, attacking from the front. They are considered a nuisance to farmers who have cattle, sheep and goats because of their opportunistic feeding behavior which includes livestock. Coyotes cause more predation losses than wolves because their range is more widely distributed, and their populations are greater. Guard dogs used to protect farm animals help mitigate economic losses. The coyote consumes mainly meat with prey species including deer, sheep, rabbits, rodents, birds, amphibians, lizards, snakes, fish, crustaceans and insects. They also feed on berries and fruits including blackberries, apples, persimmons, peanuts and peaches. During the winter and early spring, coyotes will eat grass if no other food is available. Some garden vegetables and fruits like watermelon and cantaloupes are occasionally eaten. Although coyotes prefer fresh meat, they will scavenge when they have the opportunity. Breeding occurs from late December through March. Coyotes have one partner that they are constant companions with. When females are pregnant they will stay at the dens and line it with dried vegetation while the male hunts. On average, six pups are born per litter depending on population density and food availability. Pups depend solely on their mother’s milk for their first 10 days. After that, both male and female parents will regurgitate food for pups. By the time they are 4-6 weeks old, pups can eat small mice, rabbits or pieces of carcasses and are weaned off their mother’s milk. Males have an active role in parenting the young if the female is present. If the female abandons the pups, the male will also. By June to July, the parents and pups leave the den and roam their territory while hunting. Pups can depart from their families by August, but some stay longer. Special Notes: Here in Bella Vista, coyotes can be commonly seen and heard at night. Day sightings are rare, but possible. They are a common vector for mange and many other canine diseases and conditions. Coyotes are one of the most vocal mammals and have a variety of calls. They can be mistaken for foxes, although they are much larger.